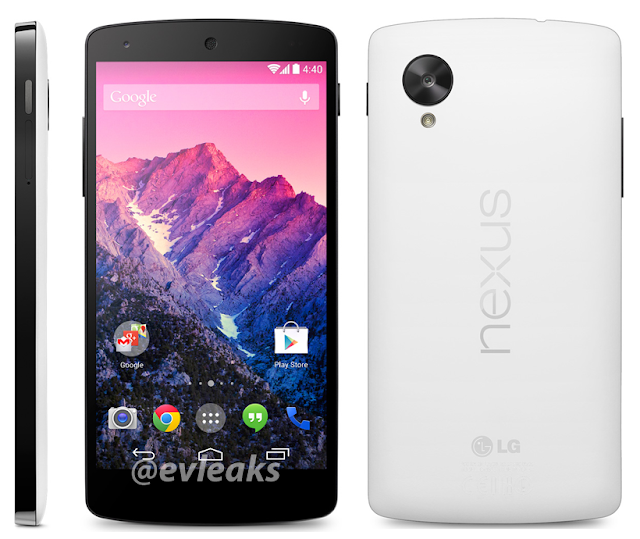 Update: @evleaks has posted the Nexus 5 in white now. And he says 11/1 so it could be possible that we will see it officially then. @evleaks has once again tweeted a new press image of the Nexus 5 from LG. The backside of the Nexus 5 looks very much like the latest Nexus 7, same style, same logo design. We can also very clearly see the new huge camera lens. It definitely seems like Google and LG will provide a better camera this time. Nexus phones usually doesn’t have so good camera. Looks very interesting. We can also see the new transparent launcher and the flatter icons we seen before. Personally I am more excited over Android 4.4 KitKat than the hardware this time. The rumor says that Google should present the new Nexus 5 with Android 4.4 Kit Kat on October 28th, but there is still no press invites out yet, so I really doubt that is true.